$24.99 Retail, $16.57 Amazon, Kindle Edition $11.99. Adobe’s software products are like Apache helicopters: Extremely effective and the very best at what they do but very complicated to operate at maximum efficiency. O’Reilly’s Missing Manual series fills in the blanks and gets you up and running quickly with tips and tutorials to perform the most popular functions with the software. 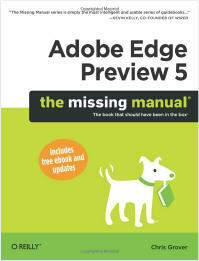 Though this book was recently released (May 16, 2012), Adobe Edge Preview 6.1 is now the current version. However, if you aren’t one of those leading edge (No pun intended) types, then you likely still own Preview 5. This Missing Manual is an essential desk reference, if you spend any time at all with Preview. The Internet, for all its positives and negatives, is a visual place. Adobe Edge Preview helps you create a more enjoyable visual experience for those who visit your website. The Missing Manual helps you do so painlessly. After a short introduction to Adobe Edge, Grover dives right into your first animation project. From personal experience, web animation is not an easy thing to do–no matter how good the instructor or the instruction is but Grover certainly makes it seem less difficult and less tedious than it is. Chris Grover manages to pack quite a bit into less than 200 pages. Overall, I like the book, its progression and its abundant graphics and screenshots. I think this book will get you started but for more advanced techniques or in-depth professional Edge work, you’re going to need a bigger book. If you’re on the fence about buying this book, I’d suggest going with the Kindle version or searching for a used paperback copy. The book isn’t bad but it’s a new book that covers only the basics and you might find yourself wanting more but not getting it here. Buying the paperback version gets you the free ebook version and periodic updates.